$5 tulip bunches to celebrate our 82nd year! Enjoy at any of our five stores. We're so glad you're our customer! 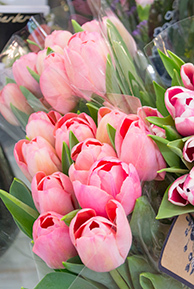 Please visit us on Saturday, March 2nd to pick up a wonderful fresh bunch of tulips for just $5. They're the perfect spring pick-me-up! Tulips are available in assorted color bunches of ten stems each. Special applies to in-store purchases made 3/2, or phone orders placed that day for same-day pickup. No flower substitutions. Limit 6 per customer, so there's plenty for everyone. Hope to see you here! With many thanks to all who have chosen Viviano's since 1937, for all of life's celebrations.